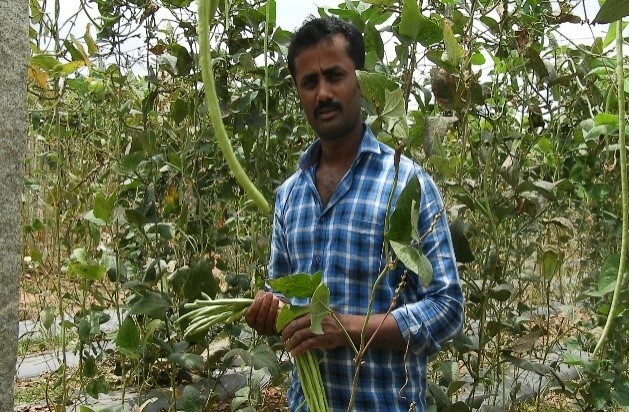 Mr.Vinoth a progressive farmer of Linganahaali Village, Shivakote Panchayat of Bangalore North District raised one acre of Yard long bean “Arka Mangala” at his field during kharif season 2018. 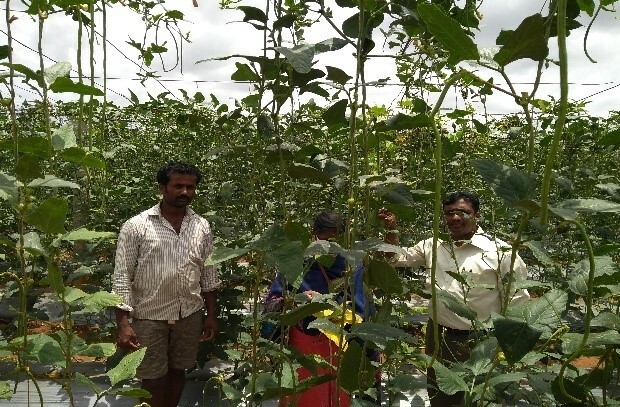 After knowing the performance of this variety, Mr Vinoth visited and interacted with Scientists of IIHR and procured the seeds from vegetable seed counter. He raised nursery for yard long bean and transplanted in the month of July at a distance of 5 x 5 feet. He has followed standard package of practices recommended by ICAR-IIHR. 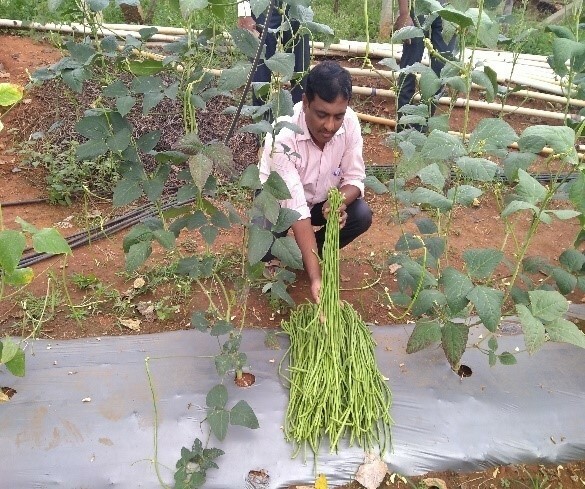 To improve yield of yard long bean, the recommended dosage of foliar application of vegetable special (4 -5g per litres of water along with 1 shampoo sachet and 2 medium sized lemons) has been practiced for three times. 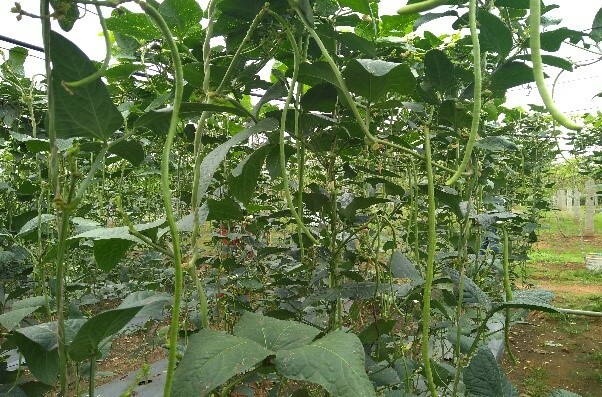 Now he is using vegetable special regularly for all vegetable crops as he has noticed that the improvement in yield and fruit quality. 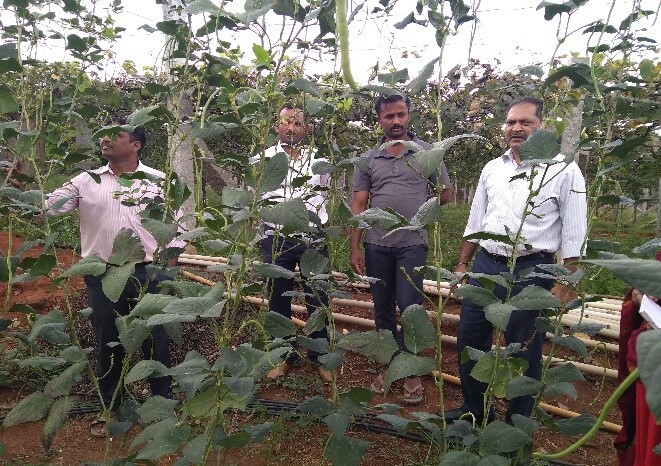 Mr. Vinoth was constantly in touch with extension division of IIHR and as a follow up and extension scientists (Dr.V.Sankar, Dr Achala and Dr.Venkattakumar) visited his field regularly. 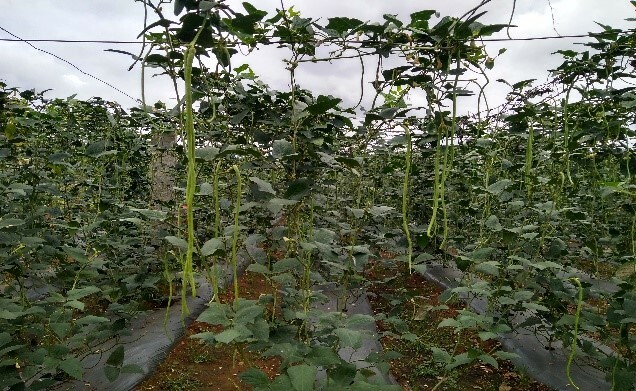 The farmer realized very good fruit yield (11 t/ac) in yard long bean and could sell the produce @ Rs 20-30 per kg in nearby market. He was very happy with its performance in terms of yield, market price and net returns. He earned a net profit of Rs 2,24,000 for four months crop duration and very much satisfied. The farmer expressed happiness that he has made a good profit with double the income from this variety compared to other variety which he has grown earlier. He also opined that this is the only variety he has seen which can give continuous flowering and fruiting. 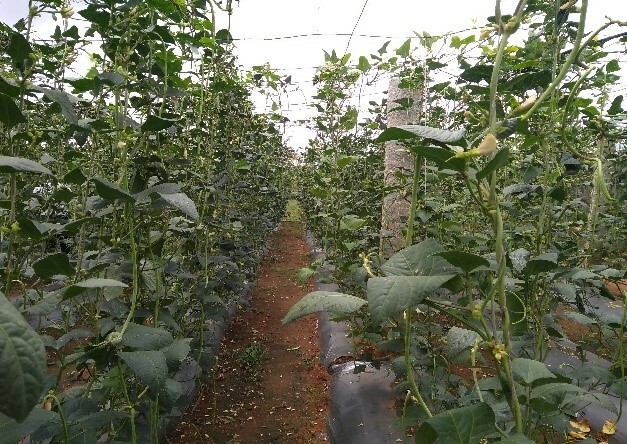 Further, the farmer opined that as the variety produces early fruiting, with tender green fruits, which are very much preferred in the local markets and fetches higher price. 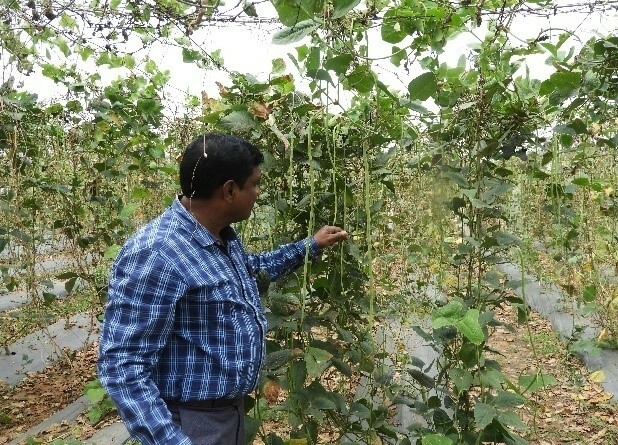 Once he started growing yard long bean in his field, neighbouring vegetable growers also came to know about this variety and field performance which he was grown in the field. He has also motivated other farmers in the village and neighbouring villages also to grow these kind of improved variety which was developed by ICAR-IIHR. By seeing the excellent performance, he is planning to grow “Arka Mangala” in another 2 acres in the coming season.